The rejection of biological and geological evolution is a pervasive problem in science education. Recent events in the United States have brought anti-evolution activity to the forefront in media coverage of science education, but Canadians are often unaware that such creationist, anti-evolution activity is present in Canada as well. In this article, various foreign and Canadian-based anti-evolution efforts that threaten biology and geoscience education are discussed. These creationist organizations and their activities may adversely influence Canadian science curricula and public understanding of evolution and science in general. Je rejet de l'idée d'évolution biologique et géologique est un problème généralisé auquel est confronté l'enseignement des sciences. Récemment, aux États-Unis, certains événements ont porté l'activisme anti-évolution à l'avant-scène de la couverture médiatique de l'enseignement des sciences, mais ici au Canada, il est fréquent que les Canadiens ne soient pas conscients qu'un tel mouvement créationniste et anti-évolution existe. Le présent article décrit divers mouvements créationnistes et anti-évolution, d'origine étrangère et canadienne, qui menace l'enseignement de la biologie et des sciences de la Terre. Les efforts de ces organisations créationnistes peuvent avoir un effet préjudiciable sur le contenu des programmes d'enseignement des sciences et sur la compréhension du public de l'évolution et des sciences en général. 1 In this article, the misconceptions found among Canadian scientific scholars as well as the general public that fundamentalist creationist activity or rejection of evolutionary theory stops at the US border, is addressed in some detail. Creationists and their supporters put pressure on schools and teachers in Canada. The Evolution Education Research Centre (EERC), often hears about these anti-evolution activities from teachers and concerned members of the community. 2 The EERC opened its doors at McGill University in 2001 with four McGill and four Harvard university professors, who have expertise in anthropology, biological evolution, educational psychology, geology, molecular biology, palaeontology, philosophy of science/ education, and science education. In addition, the Centre currently has a full-time manager, a small team of research assistants, and several prominent, international collaborators. The Centre receives modest financial support from the federal government and McGill University, as well as from private dona tions. Its mission is simple: to advance the teaching and learning of biological evolution through research. It is not an activist group. Its members often engage in outreach activities, and it does receive requests for assistance from students and teachers with regard to evolution education. 4 Stories similar to these ran in papers across Canada in late 2000, and perhaps one of the most interesting articles regarding the Ontario curriculum during that time was found in the Ottawa Citizen on November 9, 2000. Graham Hughes (2000) reported that, ironically, even though the bulk of resistance to evolution education is religiously motivated, one Ottawa clergyman was doing more than the framers of the Ontario curriculum to ensure that evolution was being taught. This article chronicled the efforts of Rev. Brian Kopke as he set up a weekend school at his church to teach the science he saw missing from the provincial curriculum. In the words of the Rev. Kopke, "I can't imagine kids going through the whole school system and coming out the other end without knowing anything about evolution." Hughes (2000) further states that, .. "there are so many kids out there who are going to be going into the sciences – and even the humanities – who need to have some idea of how all of this fits into a framework and how important science is to who we are". 5 In the United States, and in Canada, a dominant form of anti-evolutionism is "creation science". A form of what is usually called young-earth creationism, creation science holds that the earth, and the universe are about 6000 to 10,000 years old. It also accepts flood geology – the idea that Noah's flood was a historical worldwide event responsible for the fossil record and for major geological features like the Grand Canyon. Furthermore, taking the Genesis account literally, it insists that evolution is impossible except within a very limited range, for God created living things to reproduce "after their own kind". Most of the creationist organizations discussed in this article are creation science groups, but it is also important to realize that there is a diversity of opinion within these organizations. Furthermore, it is important to recognize that many Christians do not reject evolution; rather, they reconcile evolution and their religious beliefs. 6 Several foreign anti-evolution groups have organized Canadian branches. For example, Answers in Genesis (AiG), which was founded by Australian creationist Ken Ham, is one of the largest creation science organizations in America. This group is currently constructing a museum very close to Cincinnati, Ohio, that will span 50,000 sq ft, at a price of over US $25 million. The museum will house a vast collection of full scale model dinosaurs and will depict these dinosaurs as living alongside modern humans. AiG has set up its Canadian headquarters in Waterloo, ON, from where it coordinates events across the country (Answers in Genesis web-site, accessed 2006). 7 AiG, under its new banner of,  Creation Ministries International', has recently sponsored anti-evolution "field trips" and presentations aimed at refuting modern geology at sites such as the Niagara Escarpment, Canada's west coast, and at their "Creation Family Camp" on the Red Deer River in Alberta. Also, they are currently sponsoring Australian creation minister, Rev. Peter Sparrow, on his "Canadian Outback Tour". This project involves an extensive series of anti-evolution speaking engagements in Ontario, Manitoba, Alberta, and Saskatchewan (Creation Ministries International website, accessed 2006). Recently, other non-Canadian groups have been active within our borders, such as Kent Hovind's, Creation Science Evangelism (CSE website, accessed 2006), which is run from the site of Dinosaur Adventure Land, his anti-evolution theme park in Pensacola, Florida (Dinosaur Adventure Land web-site, accessed 2006). Hovind, an evangelist also known as "Dr. Dino", has made several appearances in Canada delivering his message of the purported impossibility of biological and geological evolution. 8 Although these foreign organizations are certainly interested in reaching a Canadian audience, it should not be assumed that the threat to science education posed by creationists originates only from beyond the Canadian border. There are numerous Canada-based creationist/anti-evolution organizations located nationwide (see Appendix A for a partial list). Aside from hosting web-sites, these organizations offer presentations in schools as well as invite students to attend presentations in other venues. Some of them host anti-evolution summer camps, publish very attractive anti-evolution magazines and books for children as well as for adults, sponsor creation science museums, coordinate anti-evolution conferences in communities across the country, broadcast on radio and television programs, write letters to editors of newspapers, etc. – all here in Canada! 9 The target audiences for some of these organizations are far clearer than others, but it would be wrong to assume that they all operate solely within churches. For example, Laurence Tisdall, the president of the Creation Science Association of Québec (CSAQ), claims to have debated in favour of creationism, over a dozen times, in prominent academic institutions in Canada, such as McGill University, Université Laval, and the Université de Montréal – and further claims never to have been defeated in these debates. In fact, "Canada's Creation Speaker Pages" lists, "How to debate an evolutionist and NEVER lose", as one of Tisdall's stock presentations (Canada's Creation Information Portal 2006). His touted undefeated record is questionable, but the unfortunate outcome of these events is that creationists always come away with at least one type of victory – the ability to say that they have argued creation vs evolution at respected academic institutions. Creationists reporting on such debates might imply that these activities on university campuses indicate that the validity of evolution is still being "debated" by scientists at the highest academic level, and that it is a "theory in crisis". It is, of course, not. According to the Academy of Sciences of the Royal Society of Canada (1985), evolution is "the only explanation for the diversity of life on this planet that is acceptable to the scientific community". Many prominent defenders of evolution, including the (US) National Center for Science Education, have taken the position that we should not participate in such "debates" for this very reason (Scott 2005). 10 Even though Canadian Faculties of Science normally do not invite creationist evangelists to university campuses to speak about science, sometimes anti-evolutionists find other ways onto campuses. For example, several members of the biology and science education departments at McGill were recently surprised by flyers posted around campus, advertising a presentation on "Scientific Evidence for the Existence of God". Of course, religious and supernatural questions regarding the existence of the divine are clearly not within the scope of scientific inquiry, so we were immediately skeptical. The EERC was intrigued, both by the claims made in the advertisement and by the question of which academic unit had possibly invited the speaker, Kirk Durston.
" (New Scholars Society website, accessed 2006). He also claims membership in The International Society for Complexity, Information, and Design (ISCID), which "investigates complex systems apart from external programmatic constraints like materialism, naturalism, or reductionism". This society is a project of Intelligent Design creationist William A. Dembski, and membership in ISCID is available to anyone for $45 per year or to any student for $25 (ISCID website, accessed 2006). 12 Durston was introduced at McGill as a scientist from the University of Guelph (he is a graduate student in biophysics), and he proceeded to give a two-part presentation. The first part was his advertised presentation on purported "Scientific Evidence" for the Existence of God, which he apparently gives regularly at Canadian universities, but the second part was a presentation on evidence for the divinity of Jesus Christ. Muslim students who had come to the presentation departed at this time. Perhaps they would not have attended at all had the advertisements revealed that the sponsor of the presentations was the Campus Crusade for Christ (CCC) (This group has since changed its name on the McGill campus to simple "Cru".) It does not appear to be an accident that the advertisements did not mention the sponsoring group. In fact, the New Scholars' website, including the sections titled "Purpose" and "Who We Are" contains no mention of an affiliation with CCC. However, Canadian Christianity identifies NSS as a Campus Crusade for Christ ministry (Canadian Christianity website, accessed 2006). 13 CanadianChristianity.com is an interesting website. There, one can find leading anti-evolutionists, who are, perhaps, less careful with their ideas and speech than they might be in the secular media. Within this site's pages, one can find reports of Canada's public school science teachers openly supporting the idea of teaching creationism in their classrooms. All one needs to do is to search the site's archives for words like "evolution" or "intelligent design" and myriad articles will be located - most from right here in Canada. I recently found in these pages an interview with Durston, in which he essentially says that most evolutionary biologists work under profound ignorance regarding information theory, and this ignorance is the only thing that allows these unsophisticated researchers to conclude merely from bones and teeth that macroevolution ever occurred. The interview is from a series called "Evolution Under Fire" (Dawes 2003). 14 In the same interview, Durston speaks of his visits to a "grade 13 biology classroom" under the invitation of the teacher. This illustrates the sad fact that although teachers are on the front lines of most battles in the evolution wars, they may sometimes deviate from purely scientific discussion. A case in point is another Canadian creation-in-the-classroom debacle that the public has forgotten. In the 1990s, creationist opponents of evolution were invited to speak in senior science classrooms in the Abbotsford School District in British Columbia. That case eventually involved legal action by the BC Civil Liberties Association, an ultimate quashing of the practice by the Minister of Education, and an embarrassment for the Abbotsford School District board. Still, some sources report that as many as 30% of BC's science teachers remain sympathetic to creationism (Meijer 2005). 15 Another alarming trend that surfaced through current projects at the EERC is that, the teaching of evolution is more absent from Canada's schools than people may realize. Furthermore, resistance to evolution is also found among teachers-in-training at the university level. Anti-evolutionists have been encountered actively trying to appeal to these pre-service teachers. For example, during one of the activities for elementary-education majors, a timeline of Earth's natural history is constructed. As the timeline is laid down over nearly half a kilometre in downtown Montréal, the students are occasionally confronted by anti-evolutionists from the general public who tell the students that they are being lied to by their professors about the real nature of evolution, and beseech them not to continue the lies when they have classrooms of their own. 16 While anti-evolution activists attempting to derail educational activities for teachers-in-training may admittedly be a fairly rare occurrence, creationists are commonly very good at mobilizing and successfully lobbying the secular media to gain wider exposure. For example, in 2005, after the CBC aired a show on which I was interviewed about evolution and the EERC, the station was bombarded with calls from creationists complaining that CBC radio was being too one-sided. In response, one week later, the president of the CSAQ/AQSC was given a forum, where he delivered a message of anti-evolutionary creationism couched in scientific jargon which sounded quite reasonable to many non-scientists. 17 Sounding reasonable to laypersons is a talent that many of the leaders of the anti-evolutionists share. Some creationists disguise their ideas in putative scientific language, but others use legalistic or bureaucratic jargon as a cover. Such is the case with materials produced by another Canadian creation-ist group, the Citizens Concerned about Education and Origins (CCEO). These "Concerned Citizens" attempt to enlist parents in efforts to persuade educators and administrators to allow creationist curricula into science classrooms. To this end, they have drafted the "Parental Empowerment and the Instruction of Origins" letter, which they encourage parents to sign and have their children deliver to teachers. The letter falsely informs the teacher that evolution is unscientific and that teaching only evolution is a violation of the Ministry of Education's directives. The letter is filled with quotes from legal documents and has an authoritative tone which may be intimidating to some teachers. The letter demands "
that the instruction concerning the question of origins be done within the presuppositional approach in order to demonstrate the religious nature of the two models of origins" (CCEO website, accessed 2006). The "two models" are the creationist model and the evolutionary model of Earth history. Their claim is that the evolutionary model is based on nothing more than faith, and is therefore no less a religious belief than is creationism. This idea has been a mainstay of the anti-evolutionist movement, and it has been used with some success by other Canadian creationist groups. "Pray that public schools would be open to the creation message." "Pray for our Ministers of Education in all provinces and territories across Canada that they would be open to the two model approach." "Let's keep our schools in prayer and for the teachers to be open to seeing the importance of presenting the evidence for God's creation." "Let's continue to pray for those creation organizations who promote the Creation message throughout North America within the school systems. May the school board leaders see the wisdom of including the Creation alternative in the textbooks." "Pray for Expanding Youth Ministries (EYM) and its Director, Jim Gregor. As School Divisions get larger, permission to show Creation material needs approval from authorities in more centralized offices, and this may be harder to obtain." "Jim Gregor and Ralph Underwood (EYM) met with the Saskatoon Ministerial Association to petition help in entry to the Schools and a Community wide showing of "Unlocking the Mystery of Life." Pray for open doors." "Pray for the Saskatchewan director of Expanding Youth Ministries, Jim Gregor, as he takes videos and DVD's into the schools to show students the truth of Creation." 19 These prayer suggestions show that there is intent, as well as organized strategy, within this creationist community to have anti-evolution materials presented in Canadian public schools; furthermore, the progression of the content of these requests illustrates that their strategies might be working. 20 Geoscientists and Earth science educators are needed in the struggle against ignorance and misinformation about evolution and the history of the Earth. There are many ways in which the geo-science community can meet the potential threat of anti-evolution efforts in Canada, but they all begin with becoming more informed. Recent books that discuss the creation/evolution debate in schools include Evolution vs Creationism: An Introduction by Eugenie Scott, Executive Director of the National Center for Science Education (2004), and Defending Evolution in the Classroom: A Guide to the Creation/Evolution Controversy by Brian and Sandra Alters (2001). Brian Alters is a professor at McGill University, and Director of the Evolution Education Research Centre. "Who, if not geoscientists, will testify about the need for students to understand what the geosciences have revealed about the earth and the history of life on it?" This question is as relevant in Canada as it is elsewhere. Creation Bible Centre [www.creationbible.ca] Bow Island, Alberta. Home to Larry Dye, the Creation Guy. (This name plays on the popular PBS science educator Bill Nye, "the Science Guy".) This organization hosts dinosaur camps, space camps, and star parties (all with a young-earth, creationist theme) and also produces books and magazines, toys, t-shirts, etc. Creation Truth Ministries [www.creationtruthministries.org] Red Deer, Alberta. Keepers of "Canada's largest travelling creation museum," they are ever ready to visit your area. Their current itinerary lists presentations across Canada, including several schools. You may also purchase a variety of materials on their website including "petrified teddy bears" which apparently prove that fossils form very quickly - and therefore, supposedly, dinosaurs lived with humans. Genesis International Canada [www.gira.ca] Calgary, Alberta. The members of this organization may concede that the Earth itself is millions of years old, but they also contend that "significant Biblical and scientific research" supports their belief that humans appeared about 6000 years ago and that the worldwide flood of Noah occurred about 4500 years ago. They offer articles in support of this view as well as sponsoring events, courses, and lectures in various locations. Creation Science Museum of Canada [www.ianjuby.org] Somewhere in Ontario. This is a "virtual" museum. Ian Juby offers several anti-evolution books and videos, and is now conducting a conference on how to start your own creation museum. Bible.ca – The Interactive Bible [www.bible.ca/tracks] The website's registered administrator is apparently located in Hamilton, Ontario, but its authors offer to put you in touch with a sister congregation in your area. The site gives a long list of anti-evolutionary arguments such as the co-existence of humans and dinosaurs, the falsehood of radiometric dating, young Earth evidence, and the like. There are also interesting sections on alleged evolutionary textbook fraud and legalities regarding creationism in the classroom. Creation Discovery Project [www.creationdiscovery.org] Scarborough, Ontario. Offering presentations on creation science for "your Church, school, birthday party, or other group." Life Design [www.lifedesign.ca] Through a fair bit of research, it was determined that this site is most likely run out of London, Ontario. Explore their unique definition of what evolution "is." Read their explanation of the creation/evolution debate and why they say there can be no compromise. Creation Generation [www.creationgeneration.net] Calgary, Alberta. This group has instituted Kelvin College (presumably on the grounds that Kelvin thought that thermodynamic issues prevented the Earth from being old enough) which proudly offers Diplomas, and the promise of Bachelor's and Master's degrees and even Ph.D.'s and D.Sc. 's, in Creation Science. This college has such interesting features as its admissions policy including this statement: "The student must also be in full agreement with our statement of faith and understand from the beginning of their studies with us, that Kelvin College holds firmly to the concept of a young Earth and a six day creation period as taught in the book of Genesis. Those who hold to the gap theory, theistic evolution, or progressive creationism are advised to pursue their education elsewhere." Visit their site to read about the upcoming African Safari in search of the dinosaurs they claim are still living in the Congo. Creation Moments [www.creationmoments.net] Director Ian Taylor works out of Kingston, Ontario, and is the radio voice for Creation Moments. Much of the work of the Creation Moments group (formerly the Bible-Science Association) is done in the U.S., but their daily anti-evolution messages are broadcast on 14 stations across Canada. Paradigms on Pilgrimage by Stephen Godfrey and Christopher Smith. Clements Publishing, Toronto, 2005. ISBN 1-894667-32-8The authors, a palaeontologist and a Biblical scholar, recount their personal journeys from being Young Earth Creationists to eventually accepting an evolutionary Earth history through their own professional studies. Finding Darwin's God: A Scientist's Search for Common Ground Between God and Evolution by Kenneth R. Miller. Cliff Street Books, New York, 1999. ISBN: 0060930497This book by the renowned Brown University Professor of Biology explains how this mainstream Christian has been able to reconcile faith and evolutionary science. The Ancestor's Tale: A Pilgrimage to the Dawn of Life by Richard Dawkins. Houghton Mifflin, Boston, 2004. ISBN: 0618005838A wonderful telling of evolutionary history using Chaucer's The Canterbury Tales as an organizational framework. Evolution: The Triumph of an Idea by Carl ZimmerHarper Perennial; Reprint edition, New York, 2002. ISBN: 0060958502Written by one of the foremost science essayists of our time, this book is a companion to the PBS Evolution television series. 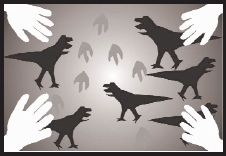 Understanding Evolution [http://evolution.berkeley.edu/evosite/evohome.html] This site from the University of California, Berkeley Museum of Paleontology provides excellent background information on evolutionary history as well as interesting and effective lesson plans for teaching about evolution. National Center for Science Education [http://www.ncseweb.org] Up to date information on evolution/creationism in education as well as a host of resources for parents, students, and educators. National Science Teachers Association - Evolution Resources [http://www.nsta.org/evresources] Resources for teachers from the world's largest professional organization for science educators. AGI Scientific evidence indicates beyond any doubt that life has existed on Earth for billions of years. This life has evolved through time producing vast numbers of species of plants and animals, most of which are extinct. Although scientists debate the mechanism that produced this change, the evidence for the change is undeniable. Therefore, in the teaching of science [the American Geological Institute] oppose[s] any position that ignores this scientific reality, or that gives equal time to interpretations based on religious beliefs only. AGU The American Geophysical Union affirms the central importance of scientific theories of Earth history and organic evolution in science education. An educated citizenry must understand these theories in order to comprehend the dynamic world in which we live and nature's complex balance that sustains us. ... AGU opposes all efforts to require or promote teaching creationism or any other religious tenets as science. AGU supports the National Science Education Standards, which incorporate well-established scientific theories including the origin of the universe, the age of Earth, and the evolution of life. GSA The Geological Society of America recognizes that the evolution of life stands as one of the central concepts of modern science. ... The immensity of geologic time and the evolutionary origin of species are concepts that pervade modern geology and biology. These concepts must therefore be central themes of science courses in public schools; creationist ideas have no place in these courses because they are based on religion rather than science. Without knowledge of deep time and the evolution of life, students will not understand where they and their world have come from, and they will lack valuable insight for making decisions about the future of their species and its environment. Academy of Science of the Royal Society of Canada, 1985, Statement delivered by Fellows of the Academy to each Provincial Minister of Education in Canada: Geotimes, November 1985, p.21. Available from: [http://www.ncseweb.org/resources/articles/5684_sta tements_from_scientific_an_12_192002. asp#can]. Alters, B., and Alters, S., 2001, Defending evolution in the classroom: A guide to the creation/evolution controversy: Jones and Bartlett Publishers, 261 p.
Answers in Genesis, 2006, AiG - Canada: [www.answersingenesis.org/Canada]. Branch, G., 2005, The battle over evolution: How geoscientists can help: The Sedimentary Record, v. 3, no. 3, p. 4-8. Canadian Christianity, 2006, Canada's online Christian resource: [www.canadianchristianity.com]. Canada's Creation Information Portal, 2006, Canada's creation speaker pages -Laurence Tisdall: [www.creationinfo. com/speaker_pages_lt.htm]. Citizens Concerned about Education and Origins (CCEO), 2006, Origins: [www.cceo.net]. Creation Ministries International (CMI), 2006, Creation on the web: [http://www.creationontheweb.com/]. Creation Science Association of Quebec, 2004-2006, Creation science prayer Requests: [www.creationinfo.com/prayer.htm]. CSE, 2006, Creation Science Evangelism: [www.drdino.com]. Dawes, D.F., 2003, Evolution under fire? – Part 1: [www.canadianchristianity. com/cgi-bin/na.cgi?nationalupdates/ 031023evolution]. Dinosaur Adventure Land, 2006, Dinosau Adventure Land: The place where dinosaurs and the Bible meet: [www.dinosauradventureland.com]. International Society for Complexity, Information, and Design (ISCID), 2006, Retraining the scientific imagination to see purpose in nature: [www.iscid.org]. Meijer, T., 2005, Evolution and Education: Humanist in Canada, v. 38, no. 3, p. 6-7. New Scholars Society, 2006, New Scholars Society - Purpose: [http://www.newscholars.com/purpose.html]. Scott, E.C., 2004, Evolution vs. creationism: an introduction: Greenwood Press, 272p. Scott, E.C., 2005, Confronting Creationism: When and How: Reports of the National Center for Science Education, v. 24, no. 6, p. 23.